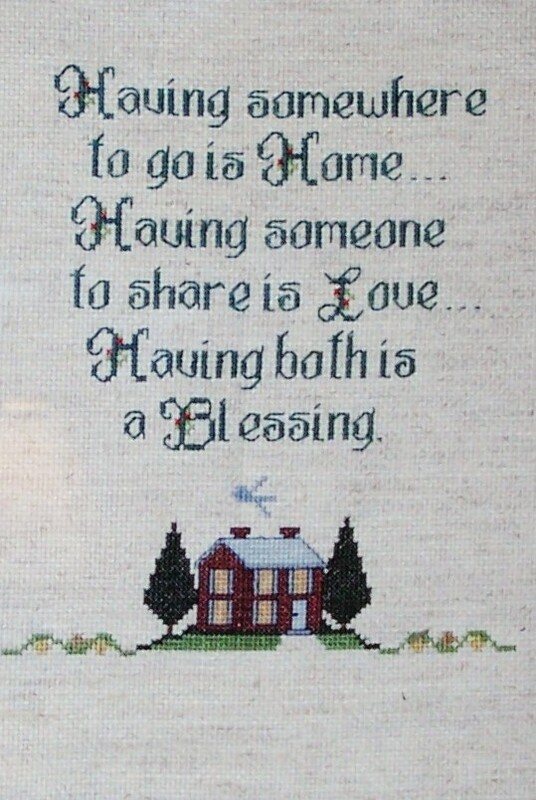 Posted on November 3, 2011	by Linda S.
I receive the email newsletter from the e-magazine Cross-Stitching.com . This is a great site for anyone who enjoys cross stitching and wants to keep up with what’s happening in the cross stitching community. I’m always on the lookout for free patterns and believe me… they have some really wonderful ones. This sampler is one I did for my son and his partner for Christmas one year. It combines a verse from a card that I received in the mail and several small free patterns that were found in different places. Let me say here that I am in no way associated with this e-mag.. ;o) But I really do enjoy getting their newsletter and visiting their site. Hope you day is filled with fun things to do.. This entry was posted in Crafts, Cross Stitch, Embroidery, Free Patterns, Handcraft, Handwork, Historical Textile, Needlework, Sewing. Bookmark the permalink. This pattern is really nice & easy to understand. Your creation is also good look, Thanx for sharing this pattern techniques.